In looking over my archives I was shocked to find that I have never done a posting on Sheep Meadow. Why shocked? Because, for me and many New Yorkers, this patch of grass is one if the most special and important places in New York City. Why did I wait so long? To get a photo that does justice to the feeling of this pastoral place. And as time passed, I just assumed that ti was a fait accompli. 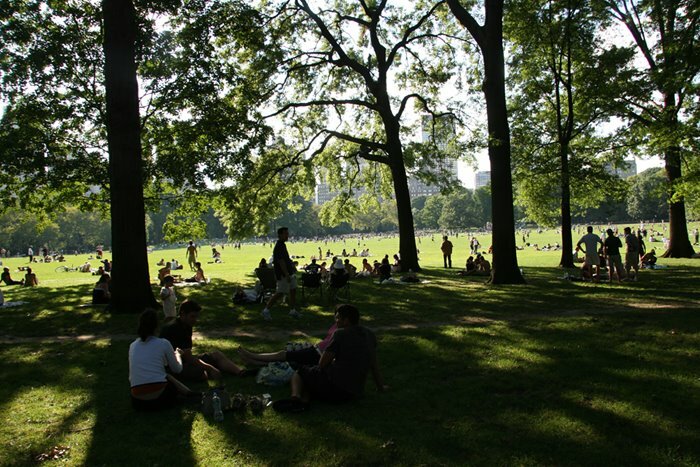 As I have written before, parks are so important in New York City. These are the only outdoor spaces we have. In many cases they have become much more than just what one thinks of as a park. They have evolved into centers for a myriad of activities - tennis, running, walking, biking, chess, birdwatching, model boating, kite flying, frisbee, horseback riding, baseball, theaters, ice skating, roller skating, swimming, boating, music performances, street performing and of course, people watching. A world of recreation and entertainment. And let's not forget relaxing. Perhaps a picnic. Or just reading. Many a weekend I have found myself in Sheep Meadow with a magazine, book or a copy of the Sunday New York Times - a veritable ritual in the city. Sheep Meadow is located in Central Park, which is literally (and for me figuratively) at the geographic center of Manhattan - both east-west and north-south. Fold a map of Manhattan and you will see what I mean. The 30 acre meadow itself is located in the lower portion of the park. Until the 1930s, sheep did actually graze there. They were moved to Prospect Park by Robert Moses.